Home / Controllers / Pro-150: Reversing, 24v – 48v, 150A, programmable. Pro-150: Reversing, 24v – 48v, 150A, programmable. 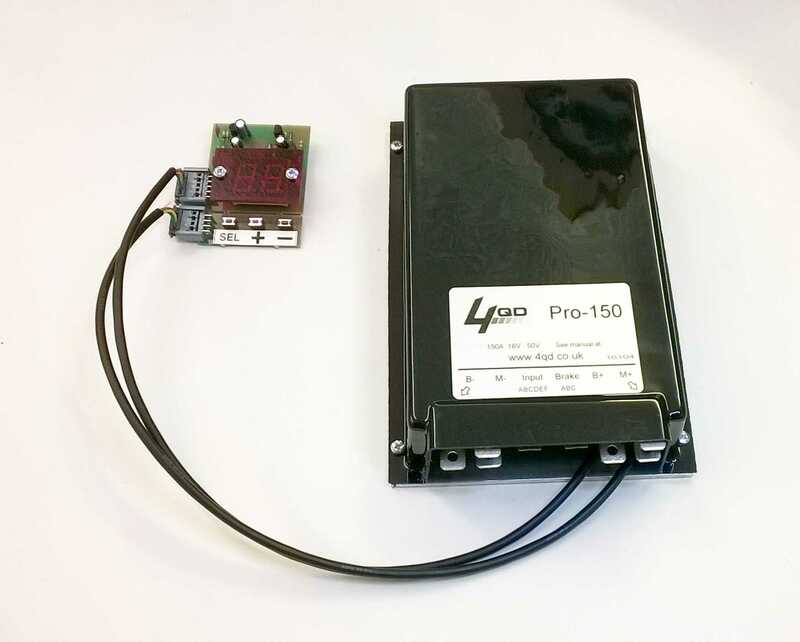 The Pro-150 is a mid-size digital controller, suitable for currents up to 150A. It is commonly used in mid-sized locos, golf buggies, and industrial applications requiring more customisation of performance characteristics. The Pro-150 is electrically and mechanically interchangeable with the Pro-120 in most applications. Add water resistant coating £12.00? Save 10% when you buy three or more controllers. Probably the most user-friendly programmable motor controller available. Programming is easy, using the (optional) low-cost combined display / programmer unit. The Pro-150 has been used in a wide variety of industrial machine applications, and has also been built into a large number of model locomotives where it has proved a popular replacement for the long serving workhorse that was the Pro-120. Will function as a standard controller without any programming. Optional display shows system state and battery voltage. Single ended, or joystick mode [wig-wag]. 10 memories for different configurations. Continuous diagnostics monitors controller and system. Under and over voltage protection. Integral box and heatsink [suitable for most applications]. Built-in heavy duty reversing relays. 16V to 48V without adjustment. Peak current 150A. 1 minute current 80A. Continuous current 60A [heatsink dependant]. Parking brake driver for vehicle applications. 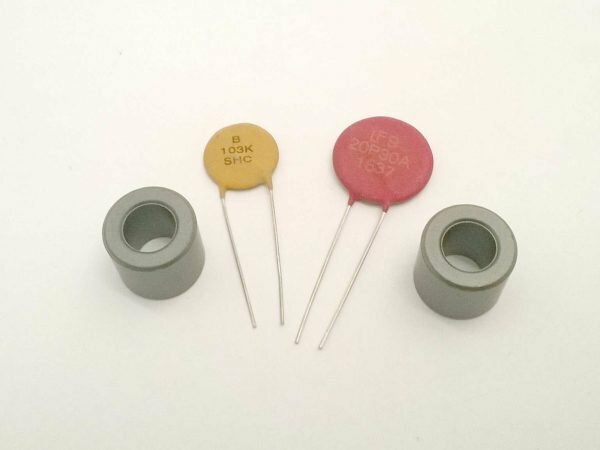 Input 1k ohm to 15k ohm potentiometer, direct voltage control, or by PWM output from a Pi or Arduino etc. We’re happy to discuss your exact requirements and configure the Pro-150 before shipping. Please note that the default settings have the reverse beeper switched on, this is a good idea for golf buggies and other electric vehicles but may not be so good for that scale loco with a sound card. 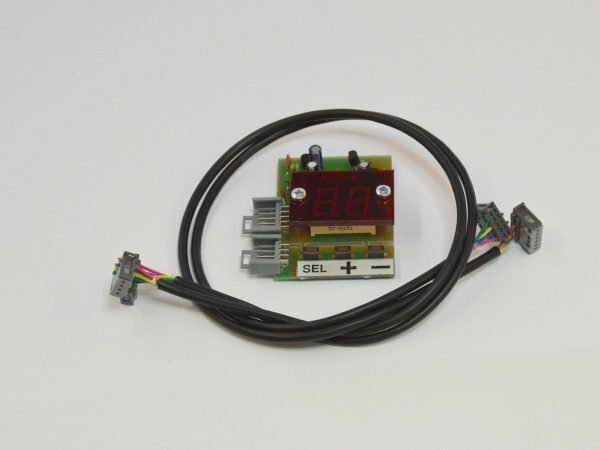 The programmer and the display are the same unit – in two halves so they can be separated once initial programming is done. The display, once the controller has been installed, is used to show battery state and to give a visible indication of any fault detected. All the essential inputs are on one 6-way connector. More advanced features are on a separate connector. See the support tab for the instruction manual, wiring diagrams, and instructions for double heading. 3 and 6 way IDC control connectors are included. The on-board computer monitors the controller and much of the external system. Should a fault be detected, the computer will shut down the controller and give an indication of the fault audibly and on the (optional) external display. if these (or other) features interest you, please email us. The manual provides full instructions on setting up and operating the controller. The manual is designed to be printed double-sided in A4 booklet format. To print the booklet from the PDF on a double-sided printer, select Booklet in the Page Size & Handling section of the print window, and set Orientation to Portrait. Although generally straightforward to program, we have had a couple of cases where some inappropriate values have been inadvertently programmed into the “pot learn” parameters. These have caused the “Po” and “Pu” fault codes to be displayed even though there is no real fault with the system. Re-setting the Pro-150 back to factory default values and starting again has cured the problem. For troubleshooting common to all controllers click here. With version 2.3, the operation of the slow / fast switch as described in the manual has been changed. If pins A and B are connected [or the – button on the programmer held for 3 seconds] at start-up, the controller will then start up in personality 9. This allows better control over the behaviour of the controller in an easily selectable alternative mode. Once pins A and B are disconnected, the controller will revert to it’s previously set personality on the next power-up. Some customers have requested that the power down mode be disabled. We have a software version 2.4. that keeps the controller awake. Please contact us if you require this version. For those customers who want to operate the Pro-150 from a joystick with a centre off position this article has instructions on how to program it. 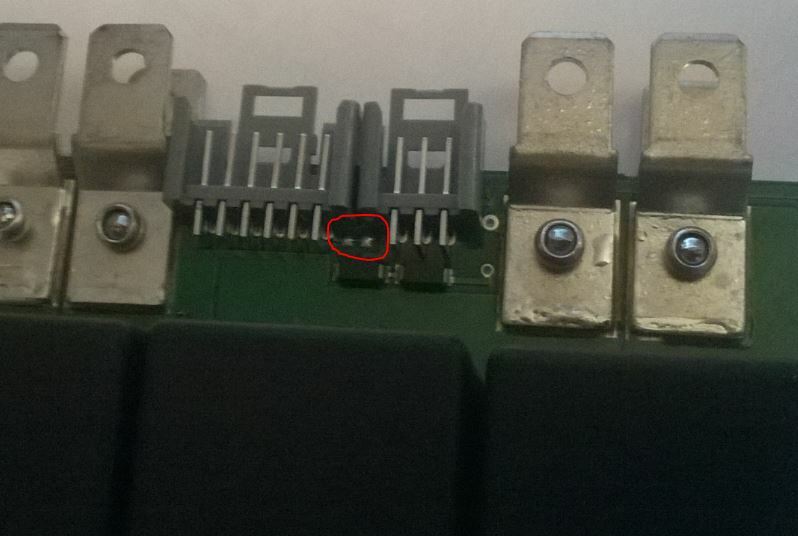 There is a very thin track on the PCB adjacent to the 3 and 6 way connectors, it’s circled in red in the picture below. This is actually a scratch through link that allows modifications to the input circuit but under certain short circuit conditions we have seen this act as a 3rd fuse track and blow. If this does happen to your controller then just bridge the pads with some 1A fuse wire. 2.5 Change to inprove production yield at 50V. We reserve the right to change the software without notice as we find ways to improve the product. If you have a requirement for a specific version then please contact us. A throttle mechanism to control the motor speed. Switches e.g. for ignition and maybe reverse. Control cable to connect the switches and throttle to the controller. A power lead set to connect the controller to the battery and motor. 9.5 mm crimp connectors for the battery and motor leads. Interfaces e.g. for radio control. Relay board to control lights and horns etc. The programming and display unit for the PRO-150 controller. This is required if you wish to change the operational characteristics of the controller from the standard settings. 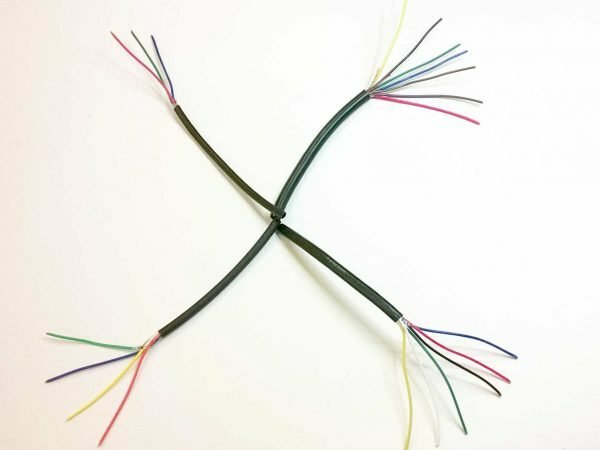 7 x 0.2mm multicore cable, the correct size for wiring our controller IDC connectors to switches and potentiometers. 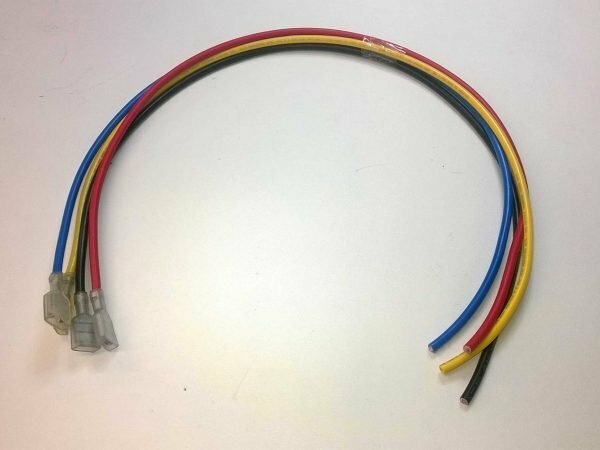 A set of 4 pre-crimped power leads with high quality, professionally crimped terminals suitable for use with our controllers. There are variants of thickness and connector type.